(Nanowerk News) In an advance that could help ease health and environmental concerns about the emerging nanotechnology industry, scientists are reporting development of technology for changing the behavior of nanoparticles in municipal sewage treatment plants — their main gateway into the environment. Their study will be published online November 12 in ACS' journal Environmental Science & Technology ("Fate of Silica Nanoparticles in Simulated Primary Wastewater Treatment"). 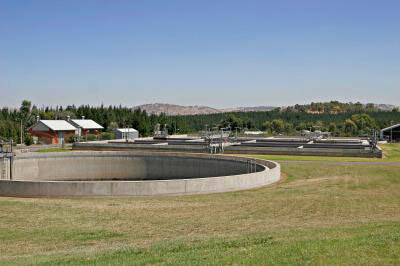 Sewage treatment plants serve as the main gateway for nanoparticles to enter the environment. Helen Jarvie from the UK Centre for Ecology and Hydrology and colleagues note that experts predict large increases in the production of nanoparticles — particles less than 1/1000th the width of a human hair — in the next decade. Manufacturers already use 2 million tons of nanoparticles each year in foods, cosmetics, medicines, and other consumer products. Studies have hinted that some nanoparticles could have adverse environmental health effects. Water discharged from sewage treatment plants is the major gateway for spread of nanoparticles to the aquatic environment. Scientists thus are focusing on how nanoparticles behave in wastewater and how that gateway might be closed off. The study simulated (primary) sewage treatment to show that coating silica nanoparticles (similar to those used in ointments, toothpaste and household cleaners) with a detergent-like material made the nanoparticles clump together into the solid residue termed sewage sludge. Sludge often is stored in landfills or recycled as agricultural fertilizer. Uncoated nanoparticles, in contrast, stayed in the water and therefore remained in the effluent stream. As the nanoparticles are simply too small to be visualized optically, the team used neutron scattering (at the UK's ISIS Facility) to view the sewage at the nano scale. The neutrons easily penetrate the sewage 'soup' and scatter strongly from the nanoparticles, allowing their aggregation behavior to be followed with time. The study demonstrates the potential for coating or otherwise changing the surface chemistry of nanoparticles to re-route their journey through sewage treatment plants, the scientists say.